Introducing our new, long awaited Sports Series Front Mount Intercooler (FMIC) System, the ultimate intercooler solution for your 535i! Our 535i intercooler was developed through development and testing with our 135i Time Attack Race Car. With the scorching heat found on Southern California racetracks, we pushed our 135i Time Attack Race Car to the limits in 100+ degree weather on numerous occassions. Developed specifically for the 535i. The heart of the ER Competition FMIC is the massive 18â€x5.5"x6â€ (26.5â€x5.5"x3â€ with end tanks) high density bar and plate intercooler core. It features 594 cubic inches of very efficient high density bar & plate core (35% larger) versus the factory 425 cubic inches of less efficient tube & fin core. Through extensive testing of different types of intercooler cores (tube & fin, bar & plate) we found that the high density bar and plate core to be the most efficient. Independent testing (all data & dynos shown below have been independently conducted by our customers) has shown that our FMIC is so efficient in cooling that it has cooled intake air temperatures (IAT) to almost ambient (outside) temperatures. We also did extensive testing on the proper size to use to effectively cool the hot charged air as well as fight off â€œheatsoakingâ€ (when the intercooler cannot transfer heat away faster than the heat building up from the hot intake air). â€œHeatsoakingâ€ is not an issue at all as shown by consistency of the IAT staying in the same temperature range throughout the WHOLE RPM powerband. Also our FMIC recovers so fast after a full throttle pull that once you shift, it recovers completely. This is why pull after pull, our FMIC does not â€œheatsoakâ€. Beat on it all day long and the IATâ€™s will consistently be near ambient temperatures. The other intercoolers may be adequate if you lived your life a Â¼ mile at a time (with hours between runs to cool down), they will definitely â€œheatsoakâ€ under harsher conditions like road racing where youâ€™re at full throttle for at least 20 minutes. With numerous laps around our local racetracks in 100+ degree weather, heatsoak is not a problem on our 135i Time Attack race car. With it's size and ability to support over 600hp, it is most likely the "last intercooler you will ever buy". One of the most overlooked aspect of intercooler design is the intercooler end tank and piping. Having shorter and less bends on the intercooler piping will promote better internal flow. This helps in reducing turbo lag, increase throttle response and faster boost spool ups. An intercooler end tank must be designed to channel and distribute air coming in from the inlet efficiently throughout the intercooler core. Our end tanks design has been revised numerous times to promote smooth internal air flow. The inlet pipe angle has been changed to provide a smooth entry into the end tank and removes an extra bend that the factory hoses have. Rubber hosing expands under boost pressure. This expansion disrupts internal flow and causes turbulence, all of which slow down airflow velocity (which causes slower boost spool up and decreased throttle response). By replacing ALL the factory rubber hoses with hard piping, noticeable increases in boost spool up and faster throttle response can be seen. That is why our FMIC kit comes with a new upper intercooler piping whereas brand FMIC kits do not. Our Sports FMIC sits in the factory location underneath the radiator. Why you ask? The radiator fan and radiator shrouding extends from the radiator above, all the way down to the factory intercooler. By sitting our FMIC in the same location, we can take advantage of the radiator fan sitting behind the intercooler to pulling air through the intercooler core. This makes for even greater efficiency, just like how the BMW engineers designed it to do. Even with just a small fan on the dyno, intake air temperatures are still very low. Also, by maintaining the factory configuration, we do not block airflow to the radiator at all. The cooling system on the N54 engine is already at it's maximum capacity and we have seen overheating issues with both oil and coolant while racing. By having an intercooler blocking half the airflow the the radiator will definitely not help it's cooling efficiency. The Sports FMIC for the 535i is a very simple, "plug and play" installation. Does not require trimming to the core support or bumper cover. Only a small tab on the intercooler tray needs to be removed. Our Sports FMIC is offered in two different packages: Basic and Standard Kits. 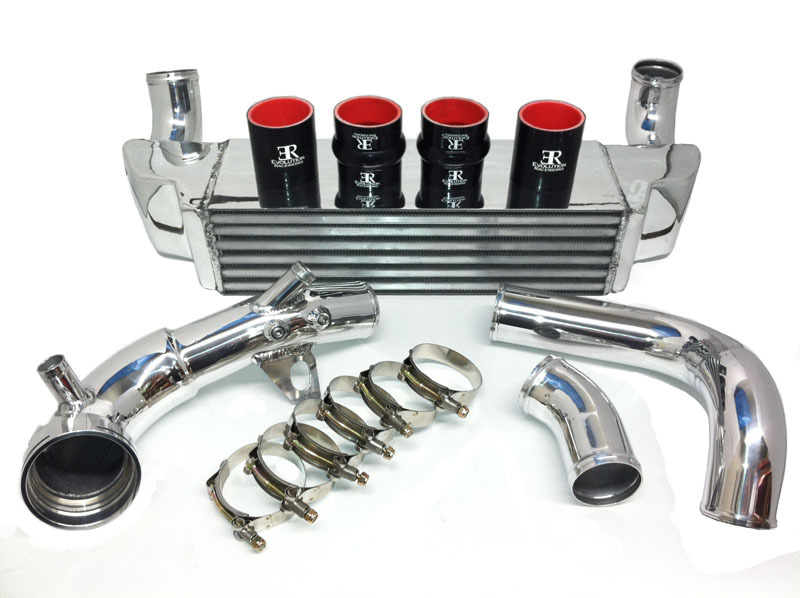 The Basic Kit consists of the intercooler assembly, lower intercooler piping, turbocharger piping, silicone hump hoses and t-bolt clamps. Everything you need to install the FMIC on your car and is what is typically included in most FMIC kits out in the market. 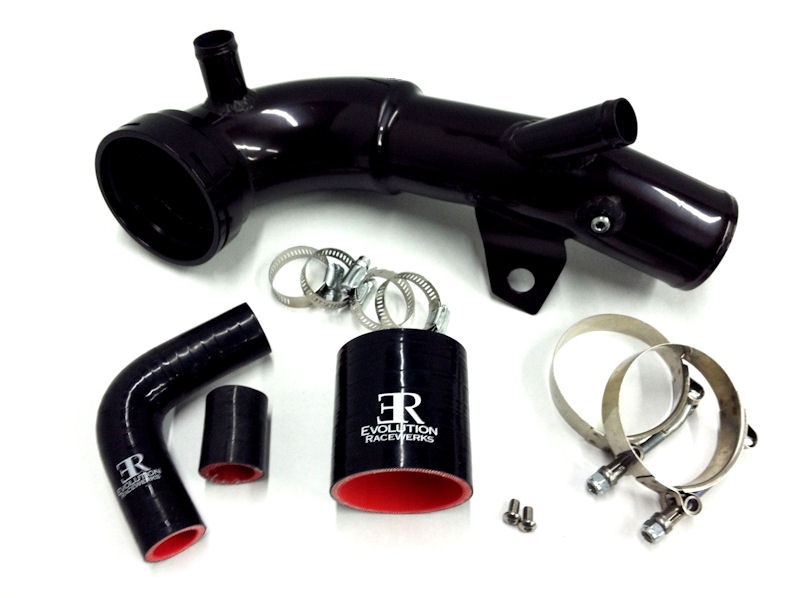 Below are optional equipment that can be added to any of the Sports FMIC package kits above. Diverter Valve & Blow off Valve Option can be added to the Standard Kits. BOV flange will be welded to the diverter valve pipe instead of the factory style diverter valve flanges. 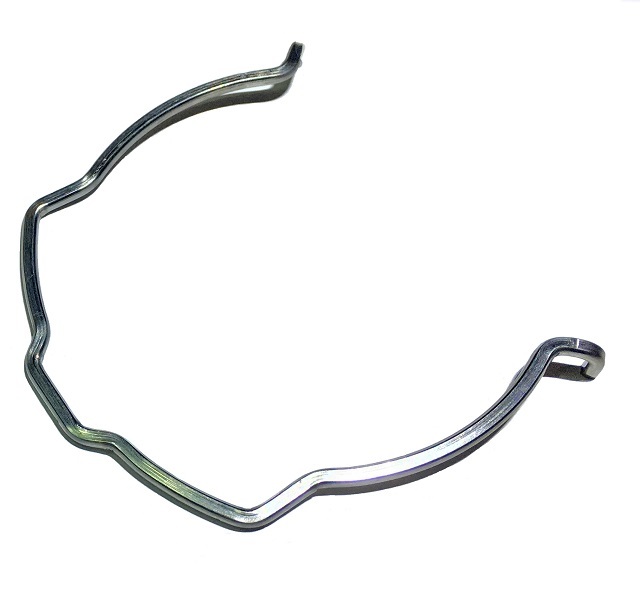 Introducing our new Diverter Valve Charge Pipe for the BMW 535i with the N54 Twin Turbo Engine. The Diverter Valve Charge Pipe is available in the same 3 finish options as our intercoolers. It is available in a brushed (plain) or mirror polish finish standard. It is also available in our Type III Hard Black Anodizing for the guys that want the stealthy, factory look. An added benefit of the Type III Hard Black Anodizing is that it hardens the aluminum piping and makes it more durable against damage (like dropping the pipe).